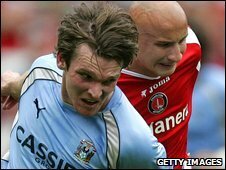 Promotion-chasing Reading have signed midfielder Jay Tabb from Championship rivals Coventry for an undisclosed fee. The 24-year-old Tabb, a former Republic of Ireland Under-21 international, has agreed a two-and-a-half-year contract. "He is a player I know well," said Reading manager Steve Coppell, referring to the time he managed Tabb when they were both at Brentford. "I'm certain he will supplement our squad as we go into this final third of the season," added Coppell. Tabb joined Coventry from Brentford in 2006. "I would like to welcome Jay to Reading and I'm sure his signing will strengthen our squad as we push for an immediate return to the Premier League," said Reading chairman Sir John Madejski. Reading are currently second in the Championship table, five points behind leaders Wolves and two ahead of Birmingham, who have played a game less than the Royals. Joining the Royals could help Tabb's hopes of another international call-up, with new team-mates Kevin Doyle, Shane Long and Stephen and Noel Hunt all in Giovanni Trapattoni's current squad.